This beautiful apartment of 60 m2 is located in a quiet area of ​​the historical center of Avignon (1st floor). Composed of 3 bedrooms, a large living room with an American kitchen, it is completely renovated. Its location is ideal for visiting Avignon! 5 minutes from the FREE Parking Piot Island !! Entirely renovated, it offers a warm and refined atmosphere. You have 60 m² with 3 bedrooms, 1 bathroom, 1 toilet, a large living / dining room with a fully equipped kitchen. - Bedroom 1: Double bed 140 (bedding superior quality). - Bedroom 2: Double bed 180 or 2 single beds 90 (bedding superior quality). - Bedroom 3: Double bed 160 or 2 Single beds 80 (bedding superior quality). - Bathroom: double sink, shower 120/90, towel dryer, hair dryer. - Large living room with a beautiful French ceiling and if terracotta, with sofa 4 places, coffee table, dining room table / office. Flat screen 81 cms, Free box 250 channels, internet, WIFI. Fully equipped kitchen: refrigerator, dishwasher, oven, induction hob, extractor hood, toaster, Nespresso coffee machine, crockery, cooking utensils and household products. 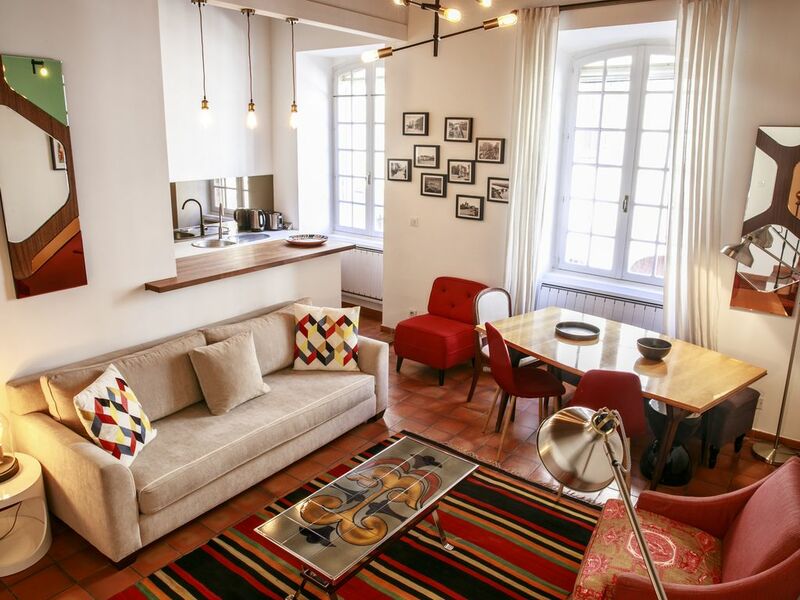 At your disposal: iron and ironing board, vacuum cleaner, guides on Avignon and its surroundings as well as a personal selection of gourmet addresses! The location of our apartment allows you to walk to the various historical and cultural places of the city as well as to the shops without needing to use your car. At 2 minutes from the Pont d'Avignon, in a quiet area, our address is ideal to visit our city. Not to mention the famous Palais des Papes at 5 minutes !! Fabulous position, fabulous apartment in the old city. If we could give this apartment more stars we would. We have stayed in many homes around the world and this is one of the best stocked well organised homes we have stayed in. Christele does her incredible city proud. Thank you. Very comfortable apartment , Christele was a wonderful host. Great location, close to shops and restaurants. Overall we had an excellent experience. The apt was clean and even more charming and welcoming than the pictures. Christèle was incredibly helpful, from carrying bags to arranging transportation. Couldn’t ask for a better host. Proche des rues piétonnes. Appartement calme. Accueil très sympathique et conseils appréciés pour les restaurants. Die Ausstattung der Wohnung war perfekt.In der Küche fehlte es an nix,wer gerne selber kocht findet eine voll und gut ausgestatte Küche vor,alles im sehr guten Zustand.Die Wohnung war sehr sauber und gepflegt und Christele war sehr aufmerksam und entgegenkommend was die Ankunft-und Abreisezeit betraf.Türcode und WLAN Zugang wurden uns vor der Ankunft gemailt,und Christele war jederzeit erreichbar.Die Lage der Wohnung mitten in der Altstadt in einem historischen Gebäude ist sehr schön,nur die Straße,eine Einbahnstraße,ist doch recht befahren.Großer Pluspunkt :alle Fenster haben Mückenrollos!!! Appartement avec beaucoup de charme . Bien situé proche du palais des papes . Appartement charmant et bien équipé.